I realize with the economy suffering and jobless rates through the roof this may not be the ideal time for you to purchase a coin for over $200K. For those of you who are in a position to buy something like this, email me and I’ll get you in touch with the seller. Here’s the description and sales information for the coin. Note that the images are for illustration purposes, and not photos of the actual coin. Stellas invariably sell in high-profile auctions and are generally unattainable through private sale. This is the only generally available Stella, from a mintage variously registered as from about 425 to slightly over 700. Of course, the term–available–is relative, and in comparison to demand for such pieces, coins of this quality are indeed rare. These coins are known in two different alloys; the standard alloy is 90% gold and 10% copper, while the metric alloy is 85.71% gold, 4.29% silver, and 10% copper. The specific alloy of this coin is unknown, nor is the alloy generally given in other auction descriptions-as it would require elemental analysis. The point seems to be moot. Obverse with large date logotype, the digit 1 slightly high, and the entire logotype slightly curved. Reverse die with D in UNITED doubled, the original placement slightly above the final position. 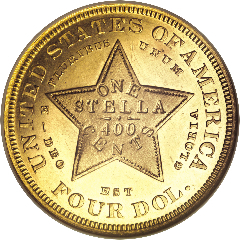 Stellas have always been one of the most popular Patterns ever issued by the Philadelphia Mint and since they time they were first coined, orders continued to come in during their limited production. Finding an attractive specimen can be quite a challenge, and this auction will certainly have an example for everyone, with many Choice to Superb Gem coins to choose from. 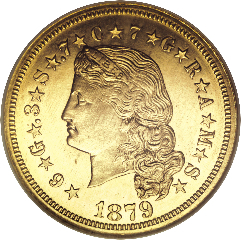 Four-dollar gold coins were struck in gold, and in various other metals including copper, aluminum, and white metal, the latter more commonly known as tin. Many of the off-metal patterns were gilt, or gold-plated, to resemble the actual gold patterns. Known examples bear the dates 1879 or 1880. Two designs for the obverse exist, the Flowing Hair design of Charles E. Barber, and the Coiled Hair design by George T. Morgan. The single reverse design is identical on all known examples, and in fact, is from a single die showing the same die polish lines on each of the different varieties. An absolutely stunning coin with mirrored fields and contrasting devices.